Farming Foible, or an Agrarian Adventure? 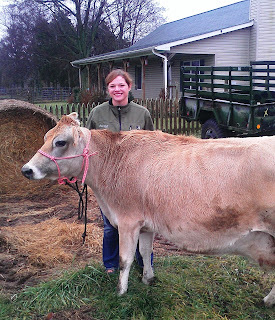 : I pretty much spent my summer becoming an alternative cow vet. I pretty much spent my summer becoming an alternative cow vet. Well, you may have noticed that I have been pretty much MIA for most of the summer. That is partially because I’ve got like 10 hours of mowing a week to do (when I haven’t broken the mower repeatedly – but more on that later), and partially because this summer has put me through an emotional wringer and I haven’t been able to share it until now. As you might assume being on a farm brings me into frequent contact with death so perhaps one would think that I would be immune to the pains of it, but I am most definitely not. Early this summer Sweetie Pie calved again. What you probably don’t know, because I didn’t tell you, was that her calf from last year (Honey Bunch) died and I couldn’t figure out why. Despite being treated by a veterinarian I felt like I had failed her, that if I had just done something differently or noticed something sooner I could have fixed it. So, when SP calved and the sweet little heifer was just another red calf I was disappointed. I know. The fact that she looked like everyone else shouldn’t have mattered, but I still wanted a redo, and the fact that she looked nothing like my darling Bunches hurt more than I care to admit. Tenderfooted, my right buttcheek. When CA brought her home she was a textbook case for joint ill; in all four joints, and her navel. 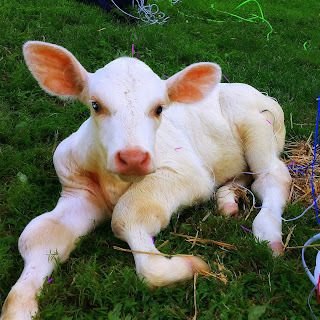 I insisted that we name her Sugar, and SP’s calf Cinnamon. My world revolved around her. What followed was roughly two months of being told that vets “don’t treat joint ill in calves,” “just euthanize her,” and “I could do something if she was a horse.” Bovine discrimination is STRONG, ya’ll. So I Googled, and read Plum’s and Merck’s, and when they didn’t tell me what I wanted to hear I read books on alternative treatments and got her an acupuncturist (whose treatment protocol included Chinese herbal medication that actually did A LOT to help her). I borrowed my mom’s therapeutic laser and gave her photon therapy every other day alongside the acupuncture, Chinese herbs, probiotics, astragalus & Echinacea, conventional antibiotics, and milk thistle (to prevent liver damage from the conventional antibiotics). I soaked her in Epsom salt baths. I gave her Reiki. I sang to her while she ate (even when she was eating at 3:30 in the morning, because by God that baby needed me so I was up and cheerful about it). I chased her around with a fan during the hot days and carried sauce pans of water to wherever she was laying. I took a thousand pictures of her beautiful little nose. I drove her hours to try (and fail) to get her treatment, and finally cajoled our regular vet into opening up on of her joints. He was amazed at how bright she was and how good her joints looked despite everything. I started making plans for how to do bovine physical therapy to help her stand and walk more easily and looking into long term options for arthritis care. Then at 6:30 one morning she started making a very distressed sound, which was odd because she had never even mooed at me. She started to bloat even before I could get her loaded in my car. I rushed her to the vet, but she was dead before he got there. She either threw a blood clot in her lung or had an abscess burst and died in my lap in the backseat while we sat in the parking lot. I was, and still am incredibly torn up about it. About a month later CA called me in a panic because Sweetie Pie was down and he thought she was dying. We hauled water to pour over her to cool her down while the emergency vet was on her way. She had no clue what was wrong with her, but treated her for low blood calcium (milk fever). She couldn’t stand on her own; so mom and dad (bless them!) drove a sling made for lifting horses and cows over at 9 pm on a Friday night (they didn’t get home from that trip until like 2 am). We lifted her up and hung her off the front end loader periodically for about two weeks before she started standing on her own again. We gave her tubes of CMPK, probiotics, antibiotics, and I force fed her baking soda thinking that maybe it was acidosis. Then about three weeks ago she started having bloody diarrhea. I begged CA to bring her over to my house and I got her some sulfa, more probiotics, keto gel, more CMPK, power punch, different types of wormer, and everything else you could think of to give a dairy cow who was showing signs of either an infection of her digestive tract or ketosis. She got better after two days and I poured the grain and alfalfa hay to her. She ate great for a week and then started feeling sickly again. As of last week I was buying spinach, arugula, and baby kale for her because she acted like everything else was making her nauseated. She passed peacefully on Friday afternoon - laying on a pile of straw in the sunshine. Even more fun? The DNA of the virus has been found in human breast cancer tissue. They aren’t positive how it got there yet, but I would expect there to be more studies on it in the next few years. The things they don’t tell you before you go buy a milk cow, huh? Another fun test came back today. Sweetie was Johne’s disease positive too. That one, again, is fatal in ruminants that exhibit symptoms. Many dairy cows carry it, and it is much easier to spread than the Leukosis. I swear. I’m going to have to set up a go fund me page to be able to test everyone for all of these things. I love that cow, but I really, really wish that someone somewhere would have told me about all of this before I got a milk cow. We followed regular protocols for including a new cow in the herd – you know, keep them separate for a few weeks and look for signs of disease. When they don’t show any signs of anything you toss them out in the pasture, and in my case inadvertently introduce the cow version of Typhoid Mary to the herd. Going forward I implore you to learn from my mistakes. Make sure that any bottle calves you bring home have had colostrum and watch their temperatures very closely. If they start going up don’t mess around with antibiotics. Call your vet and try some Baytril – or Excenel. There is a pretty good protocol listed here. You’re going to need a broad spectrum solution, and seriously if you have a vet locally who does Chinese medicine too, the herbs helped Sugar considerably. I can’t say they broke her fever, but about a day and a half after she got them she had a normal temperature for the first time in weeks. If you are interested in getting a back yard milk cow please talk to your vet about getting a test for Bovine Leukosis and Johnes disease before you bring your baby home. Many cows are asymptomatic for all of their lives, but if they aren’t it is very likely that they will die before age 10, and in some situations they can pass it along to other healthy ruminants. Forewarned is forearmed. Oh, and if you have a Grasshopper mower with the rear discharge NEVER BACK UP. You crinkle the metal like tissue paper and blow grass clippings directly towards the engine. And if you do figure out that a crinkled guard is the problem, don’t put a new on on and then back up AGAIN thinking that it had to be a fluke. It. Is. Not. It has been that kind of summer. Sweetie Pie, the day we brought her home.